Rental apartments are unique in that they need flooring that looks good, but that will also hold up to a series of tenants coming through. As a landlord, you have some control over your tenants, but that control is limited to things like whether you’ll allow pets. If you’re going to offer apartments where pets are accepted, you’ll need to consider a flooring solution that will be better suited to pets and pet owners. For apartments that don’t allow pets, floors generally don’t have to be as tough – but they still need to have durability and goods. Pet free apartments often use carpet and linoleum. Both can be easily purchased, and they come in a variety of colors, styles, and quality levels. 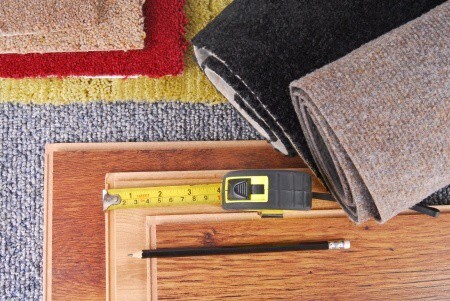 Low-cost carpet and linoleum (often also called sheet vinyl), are excellent choices for many apartments. They can last for years, and when they do need to be replaced it’s not a big expense. Still, carpets can become stained quite easily, and odors can be difficult to remove from those carpets. Linoleum can rip and tear, and once that happens it really has to be replaced. In apartments that allow pets, tile is often a good option. It doesn’t scratch easily, and it’s hard to break. It also doesn’t hold stains or odors like carpet can. While it does cost a little bit more than linoleum, that cost will be offset by the durability offered. You won’t need to replace tile nearly as often as linoleum, so it may actually be less expensive when factored out over the lifetime of the flooring. That’s an important consideration, but how the apartment looks and whether it appeals to potential tenants also has to be looked at carefully. The right type of flooring can make a big difference. When you’re deciding on flooring, consider what other apartments in the area are offering. These comparable rentals should be close to the same price, and similar in size and style. If they all have hardwood floors and don’t allow pets, you have two choices. You can go with what’s common, or you can choose something that’s very different in an effort to bring in renters who might have been turned away by the other apartments in the area. By putting in tile floors and allowing pets, you may have something that’s in demand but can’t easily be found in your area. That could lead to a lot of people wanting to rent from you, and could be a lucrative business move. If there isn’t any demand for pet-friendly rentals, though, you aren’t going to see the return on investment you were hoping for. Make sure the demand is there before you choose that option. The kinds of families who want to rent from you must be taken into consideration when you’re choosing flooring, so you provide what those people are looking for. That way, they have a great place to rent, and you get happy tenants who will take good care of the flooring you installed.